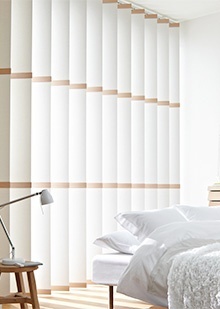 Practical and stylish, vertical blinds are a bold trend in window coverings. The new Luxaflex® Vertical Blinds collection enables you to take stylish control of your privacy, view and the amount of daylight entering your home. Our contemporary collection offers the widest variety of choice in transparency, vane widths and materials including aluminium, PVC and textile fabrics to complement any décor. The selection of stunning colours, designer fabrics and beautiful patterns is so extensive, that you can always find the perfect solution for your room and window. Our Vertical Blinds feature Child Safe systems including motorised systems, chain tensioner and cord cleat. Decorative Trims Add an individual touch to your 250 mm vanes with wooden or aluminium trims. You can choose from a number of exclusive 50 mm trims for a beautifully contemporary style. 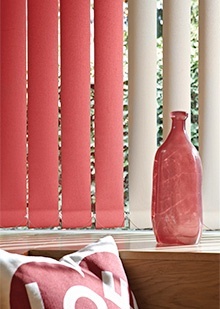 Playing with colours Create a striking and playful look by combining different fabrics in one vertical blind. You could choose to combine a coloured vane with a patterned vane in matching colours, or even contrasting styles and colours. 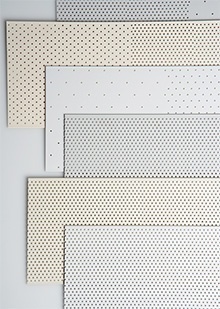 Perforated vanes Vanes with perforated patterns filter sunlight, so that beautifully diffuse daylight enters your home. Perforated vanes are an excellent choice if you would like to reduce solar glare, but wish to allow sunlight to enter your home. Luxaflex® has completely re-engineered the look of its Vertical Blinds line establishing a bold, new trend in vertical window treatments. New and exclusive to Luxaflex® are the Vertical Blind Panels but also the “Pure & Natural” collection, which offers a range of true fabrics combined with a fresh new look built on contemporary designs. A new interpretation with an eye for detail, 250 mm Panels come in an exclusive range of designer fabrics that are finished with your choice of tasteful aluminium or wood details. The sleek aluminium track with coordinating aluminium toggle adds yet more individuality to this fresh, contemporary style. The 250 mm Luxaflex® Panels are ideally suited to larger French windows and sliding doors. With 230 fabrics newly introduced, Luxaflex® innovative and extensive Vertical Blind collection now includes over 480 modern and stylish designs, from faux suede and PVC to embossed aluminium – all available in a variety of shades, vane widths and fabric treatments including dirt and moisture repellent Topar®, protective Dustblock™ and antibacterial Sanaplus™. Play with light and shade with the PVC collection’s stylish new cut-out vane design and 0.75%, 3%, 6% and 12% perforation options; multiple perforations in one vane or blind allow you to choose how much or how little light you let in. Antibacterial vanes make the PVCcollection ideally suited to catering and medical installations. For coolly urban windows, the aluminium collection now includes an exciting polychrome metallic finish, as well as an extended range of colours and silvers.